The Europeans : Welcome on our webpage! 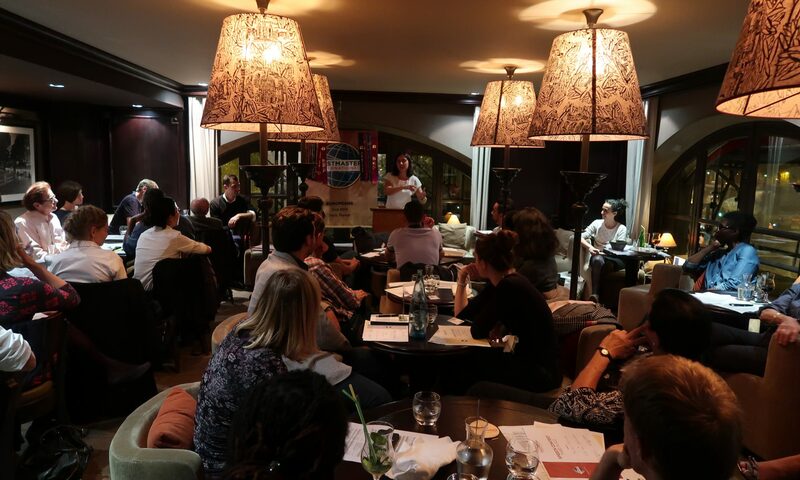 The Europeans, the only fully bilingual (French/English) Toastmasters Club in Paris, is the club for you! The Europeans » is a bilingual Toastmasters’ Club (English/French) with the objective of providing everyone with the opportunity to practice speaking in front of a group of people either in French or in English, at the choice of the speaker (no « franglish » allowed). You do not need to be a native speaker but you should be fluent in both languages (English and French). Speaking effectively in public cannot be learned in a day. It takes practice. At Toastmasters, members learn by speaking to a group and working with others in a supportive environment. At Toastmasters the Europeans, you will learn to relax, plan, and present a terrific speech, whether you have 10 days to prepare, or just 10 seconds. You will learn and practice in a friendly, supportive and positive learning environment with people who are there for the same reason you are – to become better communicators. Also, you will learn to become a leader. At toastmasters you can discover leadership talent by participating in the regular activities of the club: you will learn how to listen, think critically, plan, organise, manage time, facilitate, motivate, mentor and build a team. “Toastmasters The Europeans », a non-profit organisation, was started in 1996. The Club is a member of Toastmasters International which comprises almost 17,000 clubs throughout the world. The Europeans est un club bilingue (Français/Anglais) où tout le monde a l’opportunité de pratiquer la prise de parole en public en Français ou en Anglais, au choix de l’orateur (le « franglish » n’est pas accepté). Vous n’avez pas besoin d’avoir le Français et l’Anglais comme langues maternelles mais vous devez les parler couramment. On n’apprend pas à bien parler en public en un jour. Ca prend du temps. Chez Toastmasters, les membres apprennent à parler en public à travers la mise en pratique et le retour des autres membres, le tout dans un environment bienveillant. Chez The Europeans, vous apprendrez à vous relaxer, préparer et présenter des discours exceptionnels, que vous ayez 10 jours ou bien 10 seconds pour le préparer. Vous apprendrez et pratiquerez dans un environment positif, chaleureux et bienveillant avec des personnes qui sont là pour les mêmes raisons que vous, devenir des meilleurs orateurs. Egalement, vous allez apprendre à devenir un leader. Chez Toastmasters vous pouvez développer vos talents de leadership en participant aux activités du club: vous pourrez améliorer votre capacité d’écoute, votre capacité d’analyse critique, mais aussi comment planifier, organiser, animer, motiver, guider et construire une équipe. « Toastmasters The Europeans » est une association loi 1901, crée en 1996. Le club est membre du réseau Toastmasters International, qui regroupe plus de 17.000 clubs à niveau mondial. In « Toastmasters Europeans » there are no « teachers » as such, although members may choose to have a « mentor » to advise and support them. Club members improve by putting into practice the techniques set out in the Toastmasters’ manuals, which all members receive, as well as from positive evaluations of their speeches. During the meetings, each member is an active participant in the evening, either as a speaker, evaluator or in one of the other roles necessary to run a normal meeting. Therefore, at Toastmasters meetings, you have many opportunities to speak and gain confidence in different ways: by giving your own prepared speeches by participating in improvisational sessions, by benefiting from evaluations. Each time you speak you will be evaluated by another member. This helps you progress and improve. With each meeting that goes by, you gradually acquire new techniques and are able to put them into practice. Speech n#1 Allows you to introduce yourself to club members. Speech n#2 enforces sincerity and conviction about a personal viewpoint. Speech n#3 teaches you to structure an effective speech by organizing your ideas. Speech n#4 accentuates the importance of body language. Speech n#5 teaches us to use our voices most effectively. Speech n#6 will help you use choose the most effective vocabulary for the spoken word. Speech n#7 calls for you to bring together and apply the communication skills learned in the 6 preceding projects. Speech n#8 teaches you to use visual aids to enforce your message. Speech n#9 helps you develop your persuasive skills. Speech n#10 enlists you to give a stimulating and charismatic speech. After completing these 10 speeches, you will have conquered the basics of public speaking. You will then be ready to refine those skills and become a masterful speaker, able to successfully handle any type of presentation. You will be ready to work with Toastmasters’ advanced manuals. Each advanced manual treats a specific type of communication (The entertaining speaker, technical presentations, humorously speaking, etc), thus allowing you to concentrate on the type of communication skills most important to you, whether for professional or personal reasons. We are often asked to speak without being prepared: in meetings, seminars, job interviews, exams, simple conversations, etc. We must be able to get our thoughts together in just a matter of seconds in order to speak in a logical and coherent manner. During every Toastmasters Europeans meeting, there is an improvisational session. Any member can be called upon to speak on a given subject for one to two minutes, on the spot. This helps you learn to think on your feet, and not succumb to panic but to structure your ideas while you speak. This exercise, called Table Topics, gives us the wherewithal to face up to all questions, and feel more prepared. Each prepared speech is evaluated by one member of the club. Evaluations are always done in a positive manner. The evaluator identifies the strong points of the speech and gives suggestions as to what might have made the speech even better.